The big day has finally arrived – your spouse’s birthday party! Delicious food and refreshments are on the table, gifts are wrapped, and the first guests are about to arrive. Everything is perfect including, of course, you entertainment – a singing telegram in Boston by Amazing Balloon-a-Grams! You can rest assured that, like everything about your meticulous planning, your party entertainment will be the best available anywhere. Your singing telegram in Boston will be performed by the most seasoned professionals who will unquestionably make your event a positive moment to remember for all of your guests! Each singing telegram in Boston is performed by entertainers who are highly acclaimed in song and dance. Their beautiful voices and clever footwork will delight your guests. At the same time, their hilarious comic stylings will keep the smiles and laughter coming all night long! Exciting individuality is a key hallmark of each and every singing telegram in Boston performer from their offerings of original tunes to spectacular costumes. As a result, you’ll have your choice of many highly unique characters for your party or other event. How about something classic – our “Marilyn” in her white dress brings back the era of the Hollywood starlet! Meanwhile, our “Austin” – everyone’s favorite man of international mystery – has an exciting 60s retro flair. Traditionalists, on the other hand, will enjoy a singing telegram in Boston delivered by such all-time favorites as a gorilla, clown, stork or pirate. We even offer a “Leprechaun” character who will be sure to provide plenty of hilarious blarney for any festivity. Our singing telegrams are not just for parties, however, they add a special entertainment edge to public and private festivities celebrating anniversaries, graduations, baby showers, bachelor parties, and farewells. Businesses, too, will benefit from each singing telegram in Boston as our performers will be the highlight store of promotions, trade shows, street fairs and other occasions. 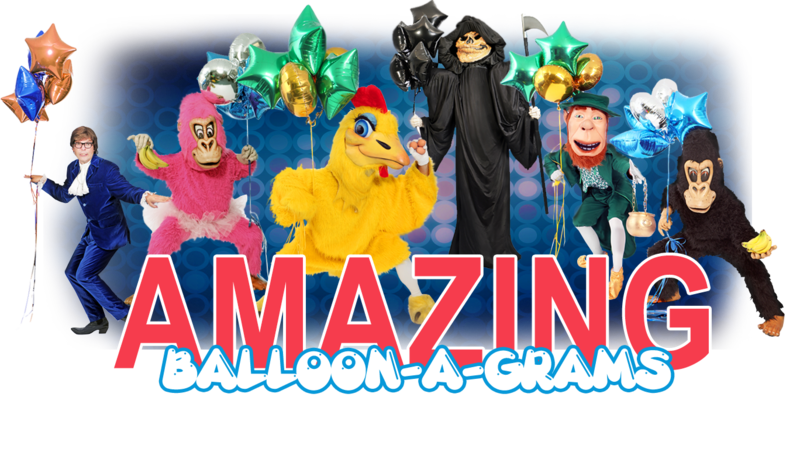 Our Amazing Balloon-a-Gram performers are ready to come to your next event in southern New Hampshire, Massachusetts, Rhode Island and even parts of Connecticut.